The best reason to take anti-HIV medications is to achieve “viral suppression.” Reaching viral suppression means that the amount of HIV in your blood is very low. Keeping HIV at this low level helps you to stay healthy and live longer, and greatly reduces your chances of passing HIV on to others. To achieve viral suppression, it’s important to take your anti-HIV medications – also known as anti-retroviral treatment (ART) – exactly as prescribed. This “treatment adherence” usually involves taking three classes of anti-HIV medications each day, sometimes combined in one pill. It’s important to stay as true to your treatment regimen as possible, without skipping medications or daily doses. Excellent treatment adherence will increase your chances of achieving viral suppression. Only about 25 percent of people living with HIV in the U.S. have achieved viral suppression. African Americans are least likely to have controlled HIV in this manner, with 21 percent achieving viral suppression, compared to 26 percent of Hispanics and 30 percent of whites. The 25-34 age group is the least likely to have achieved viral suppression compared to other age groups, with only 15 percent of individuals 25-34 reaching this important goal. Youthfulness will not beat HIV – only careful adherence to treatment will. 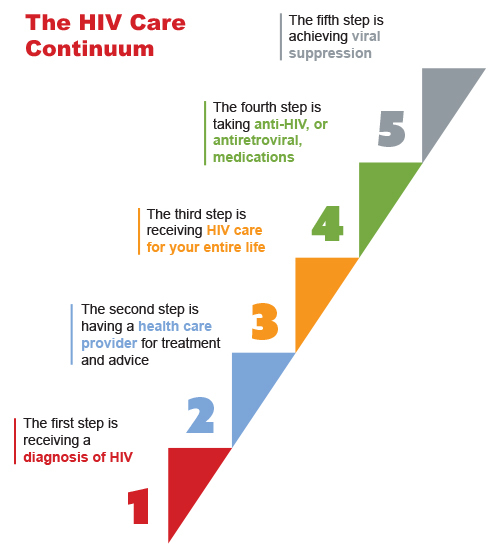 Reaching viral suppression is the fifth and final step of the HIV Care Continuum. Most people living with HIV are lower on this ladder, unfortunately. The first step is receiving a diagnosis of HIV. About 82 percent of people living with HIV have reached this step. That means about 1 of 6 people living with HIV don’t know they have HIV. It’s important to get tested and know your HIV status. 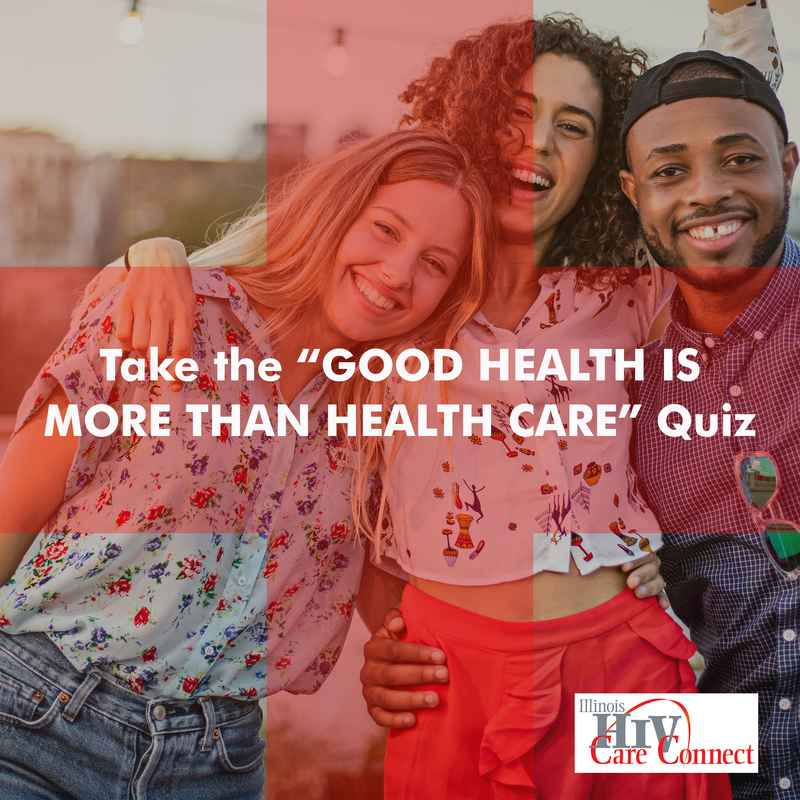 The second step is having a health care provider who can offer you treatment and advice to help you stay as healthy as possible, and to avoid from passing HIV onto others. About 66 percent have reached this step, leaving about 1 of 3 of people living with HIV without a regular care provider. Your Illinois HIV Care Connect case manager can help you find a health care provider. The third step is receiving HIV care for your entire life. Because no cure for HIV exists at this time, you must receive HIV care regularly. About 37 percent of people living with HIV receive regular care. However, about 2 of 3 HIV-positive individuals do not receive regular care. The fourth step is taking anti-HIV, or antiretroviral, medications. The recommended treatment for HIV infection, antiretroviral therapy, or ART, prevents HIV from making copies of itself. This treatment generally means taking three classes of anti-HIV medications each day, sometimes combined in one pill. About 1 of 3 (33 percent) people living with HIV have reached this step. The fifth step is achieving viral suppression – a low level of HIV in your blood. Viral suppression can help HIV-positive people live healthier and longer lives and can reduce the likelihood of transmitting the virus to another person. Taking your HIV medications regularly makes the greatest impact on viral suppression. About 1 of 4 (25 percent) of people living with HIV have reached this step. If you haven’t yet, take the necessary steps today. Enrolling in Illinois HIV Care Connect can help. Learn more about viral suppression and the HIV/AIDS Care Continuum.